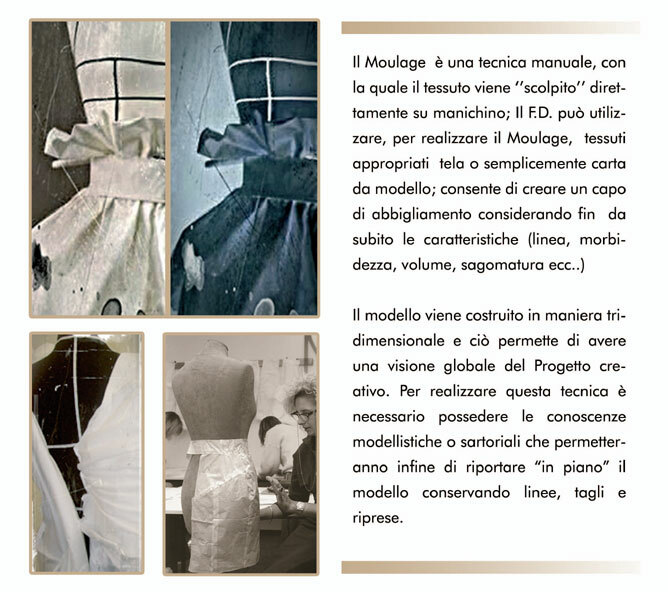 The Moulage is a manual technique, with which the fabric (carved) them directly on the manikin; the F.D one can use, to achieve Moulage, appropriate tesuti canvas or simply as a model paper; It allows you to create a piece of clothing considering since the features right away (line softness, volume, shape etc ..). The model is built in a three-dimensional and this allows you to have a global vision of the creative project. To carry out this technique you must own the modeling and tailoring knowledge that ultimately will allow to bring back (flat) the medello preserving lines, cuts and shots.